In 1993, Irvin Welsh’s novel Trainspotting shook audiences to the core with its graphic and brazen depiction of the lives of several people with heroin addictions living in Leith, Edinburgh. In the wake of Trainspotting’s success came the beloved 1996 film adaption, as well as a stage adaptation by Harry Gibson. In 2013 the play was given an immersive twist by In Your Face Theatre, and has since been performed around the world, including a couple of stints at the Edinburgh Fringe Festival and The Vaults at Waterloo, where it has now returned. The Vaults’ slightly gritty, rough and ready atmosphere makes it the perfect home for Trainspotting Live. Before the play even begins audiences are forced into the world of Trainspotting Live, and bombarded with lights and sound in a preshow rave which overloads the senses. 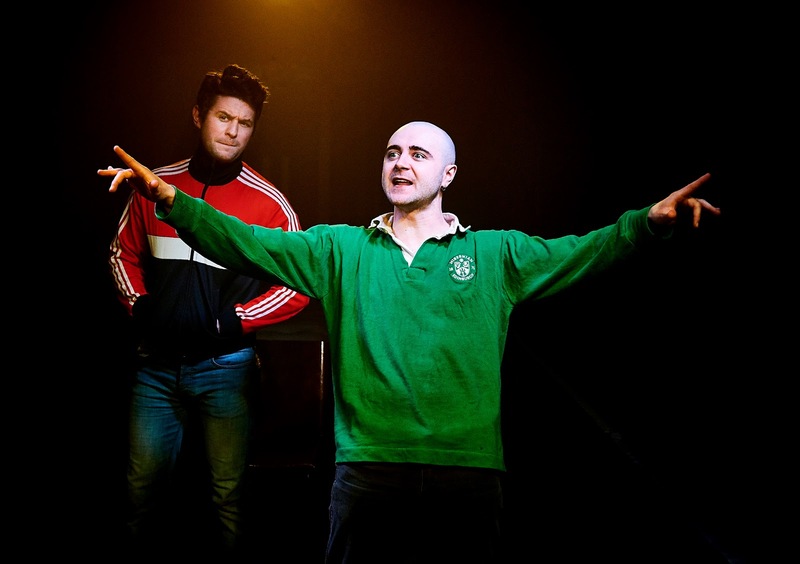 Staged in traverse, the play plunges audiences into the grim drug fuelled underbelly of Leith, inhabited by Mark Renton and the band of coarse delinquents he associates with. Renton speaks directly to the audience, boasting about his drug usage and dragging them along with him on countless repulsive escapades. Funnily enough though, in spite of all of the immoral, illegal or even just plain disgusting things Renton and co. get up to, it’s impossible not to be taken by his unabashed openness. The genius of Irvine Welsh’s original writing, which carries over into Harry Gibson’s stage adaptation, is in the fact that Trainspotting presents all of its characters as victims of their circumstances, but never excuses their actions. They are, after all, people let down by the society which they live in. Renton and his pal Tommy even share an entire scene about the fact that they are judged negatively because of the school they went to. Admittedly, this scene also takes place whilst they try and cheat the system to keep claiming a job seeker's allowance with no intention of actually doing much job seeking, but nevertheless it helps to paint a picture of the characters’ upbringings. Frankie O’Connor is a maniacal force of nature as Renton. With a twinkle in his eye, he leads the audience matter-of-factly through all manner of often rather hilarious, yet harrowing follies. It’s incredible how quickly the normality of taking hard drugs washes over the audience. It’s easy to laugh at Renton’s unfortunately timed expulsion of bodily fluids, and the jabbering of Finlay Bain’s Tommy, who attends a job interview while on speed. But Gibson’s writing, and the performances given by O’Connor, Bain and the rest of the cast, ensure that the more sinister side of their lifestyle is rarely intangible. Trainspotting Live’s 75 minute run time races by at 500 miles per hour, and its intensity never dissipates. Midway through, the tone switches from humorous to horrific and with a sudden urgency, a series of distressing scenes puncture the atmosphere, sucking all remaining air out of the already claustrophobic auditorium. As the lives of Renton and his friends fall apart before the audiences eyes, the remarkable stamina of the cast is impossible to ignore. One of the most disturbing later segments of the play sees Tommy try heroin for the first time; a decision which sets him on a nightmarish downward spiral. It’s a brutally honest plot point which seems to take place a millions miles away from the play’s grim rave begins, which retrospectively seem somehow safe and performative. Not for the feint hearted, Trainspotting Live is a no holds barred theatrical experience which will leave audiences shell-shocked. Perfectly maintaining the essence of the source material, this grimy and visceral immersive play needs to be seen.